I'm using the studio autoconverter for V4 and V3 clothes when loading them on to a genesis figure. The clothing item always fits perfectly as far as the hip. But further down from this, particularly with skirts or dresses, the seam between left and right thighs is always broken, and nothing I do will fix it. This happens with both V4 and V3 MFDs as well. There is no "skirt" in the heirachy list as there is in poser so the only way to manipulate it is via the morphs which is unsatisfactory. 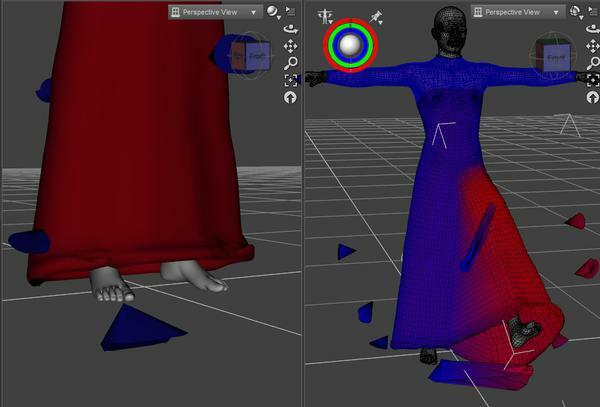 In Poser you could bend, twist and translate the skirt to any position. Since the MFD products are made by DAZ I would have expected them to work ok in DStudio. Skirts have always been a problem, even going back to my early days in Poser 4, with Poser's rigging you just can't have leg groups in a skirt as you couldn't weld them together, so skirts would split from hem to crotch, so they make all skirts part of the hip group and supply ghost bones and/or morphs to get around the posing. With WM rigging you don't have the welding problem as you don't have groups in the mesh, and with properly painted weight maps things like skirts can work really well without ghost bones (still trying to learn this part myself), however with autofit you are relying on the very basic WM that's in the projection templates, which will allow a knee length skirt to work so-so but with the odd crumple zone between the two thighs. Longer skirts do have a problem, as the template is only knee length, so any WM rigging below the knee is coming from the Genesis rig, which pretty much leaves you having to learn WM rigging to get things to work right. Dynamics would solve this issue, but you'd need to use Poser for than seeing as we don't have anything other than that useless Optitex system. I thought MFD was updated for Genesis? Thanks for that reply. Well, that is disappointing. 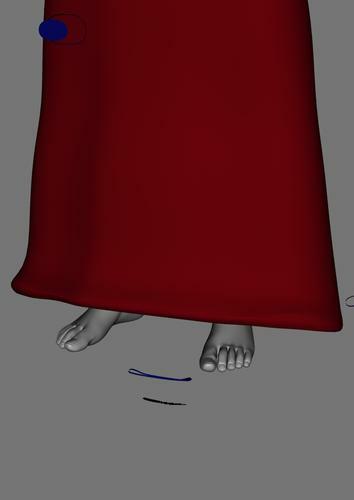 I only get occasional seam/weld problems in Poser and they can generally be overcome but in Studio there is a horrible black line from the knee down to the bottom of the skirt. So that means that 70% of my addon clothes just don't work at all. I'm not technically minded but I find it extraordinary that a way around this has not been found by DAZ. The skirt by its nature can always be adjusted by transitions and rotations, so why is there a problem? The more I get into Studio the more I feel the whole thing is becoming a constant battle of troubleshooting. At least in Poser 7 I get work done. Thanks again for the response which is appreciated. The MFD was updated for Genesis and all the parts and morphs are present. I noticed you are using a very old version of Poser also, you might consider upgrading that to improve your work flow. Poser 7 "very old"? Goodness! Is Windows Vista "terribly old" too, because that's about the same age and it runs more or less as well as Windows 7? I didn't realise MFD was updated for genesis. I knew it was a new product at a new product price. I have MFD for V3 and V4. Am I now required to purchase it full price yet again for Genesis? That's quite a lot of MFDs. Why am I not surprised that you run Vista? As it turns out, the public release of Vista was one month after release of Poser 7 (12/06). You can run what ever software you choose. I have no vested interest in any app or OS. I've said this several places, but it really does not work well putting leg bones into skirts. Many items end up in a mess and some tear. The best solutions are front, back, left and right bones. Even better it they are repeated lower down to get good movement. Quite why DS sticks in leg bones which has long been known not to work for skirts is a mystery. Maybe it was a cheap and cheerful all purpose solution. I live in hopes that one day it will be improved. 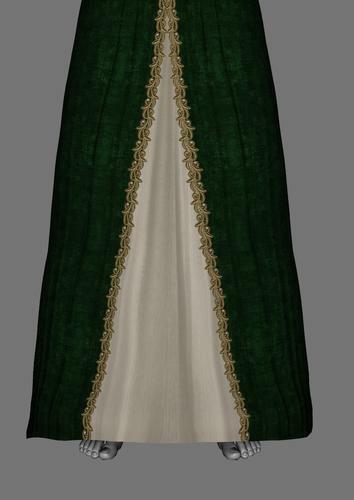 For dress rig: Genesis Basic Clothing Rig Kit http://www.daz3d.com/shop/genesis-basic-clothing-rig-kit. I don't know if this two things can be mixed to obtain a rigged skirt with original morphs. I think, maybe. I didn't say I run Vista. I have win7 with a very fast system. I meant that Vista is not that old, and nor is Poser 7. 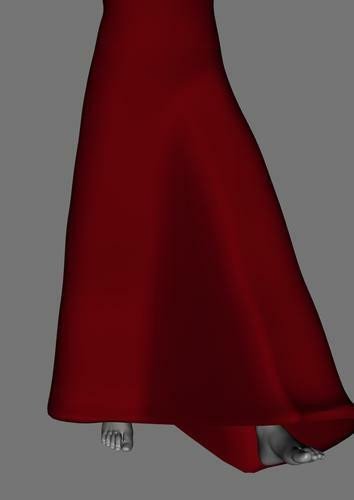 I'm considering updating Poser to 9 but from the reviews it doesn't seem particularly radical unless you buy the pro version running 64 bit, but that is a lot to pay for slightly faster rendering. As one review said, Restricting 64 bit (more RAM access) to Poser Pro only is a bit like declaring tomato ketchup a luxury food. $249 for weight mapping and 64 bit is a very expensive upgrade..
Could you post an image so I can see what is happening? Pen the attached image shows what happens when you autofit V4's MFD, the hem is all curled up and crumpled, this happens because V4's feet point down, and autofit tries to bend them up to match Genesis, it's field of influence is catching the hem. @ Baglet, While you can use ghost bones with WM they really shouldn't be needed, with a single skin mesh you don't have to worry about it splitting from hem to crotch like it does in Poser, you just need to get the WM correct for it to work, and as you can see from the second part of my pic, the WM from autofit is pretty crap, it should be a smooth transition from one leg to the other and not stop dead like it does in the pic. @ gilikshe, DS4.5 keeps the morphs when you use autofit or the Transfer Utility, so that link is out of date, and only of use to anyone foolish enough to still be using that buggy alpha called DS4.0. I would be so grateful if you showed us how to do that. Thanks Bejaymac. I'm still getting my head around weight-mapping but your picture explains the problem. It does look like they have only set it up for pants. As I use many long skirts that is annoying but gives me a bit of confidence that I can make some in MD that work and no need to fuss with bones. Once I've mastered weight-mapping anyway. Thanks Bejaymac. Very funny thing, I have DS4.5 installed, but my head still is in 4.0 in some things. Increased Collision Iterations and smoothing interval. It's not perfect but it's 5am here still having my first cuppa and only up because I couldn't sleep. I'll have a proper look later when I'm more awake. A lot of things that get crumpled with autofit are fixed using the smoothing modifier. I would be so grateful if you showed us how to do that. I have a thread in the Art Studio where I'm playing with autofit and I'm happy for anyone to join in and add info there also...the aim was to see if we could get info on using autofit in one place to make it easier for people to find. I will see if I can't get something together. It won't be this weekend, I want to work on a couple of projects I've got going but I will try and write down what I do and post it next time I'm using autofit and hexagon together and post it to that thread. Just had a quick play with the left leg forward. 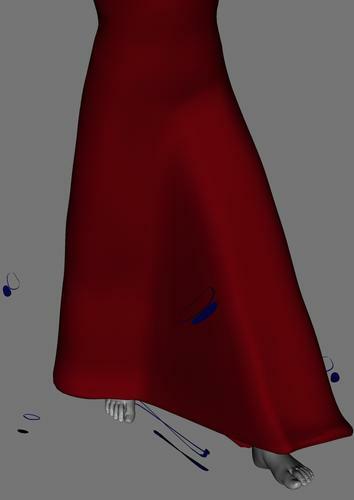 The only thing I'm getting is the body handle (blue bit) shows stretching and when turned off it looks alright there is a little bit of distortion around the hem which might need a morph to fix it but I'm not getting that weird distortion on the front that you had. Not sure if that's because I've already used smoothing. It's going to need a bit more than a little smoothing Pen, the hem at the front is meant to sit on the ground, so you need to drop that down about 4 inches, using Dforms or in Hex, the WM for the thigh bones is rough, and there isn't any for the shins, plus the handles are a mess, all in all a lot more work than your average user will want to touch. From what I read if you have the Unimesh fits version of the MFD, that's the one with all of the Gen 4 morphs, it was linked to earlier in the thread, then you can reset your downloads and get the Genesis version that way, but if you only have the original V4.0 version then your out of luck. 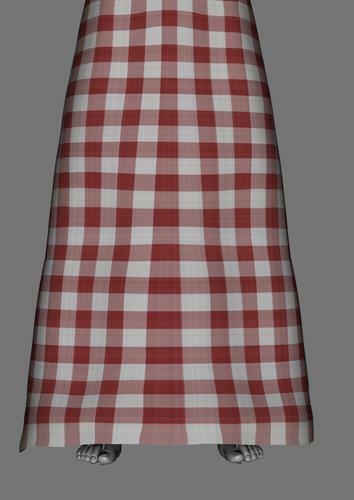 However if you happen to have a long dress that's already got proper WM rigging, then you could use that with the Transfer Utility to add that WM to any other long dress/coat, including a reshaped and fixed MFD. I took it in to Hex...the smoothing was a 5 min job, the morph in hex took less than an hour and probably requires a bit more work but shows that it's fairly easy to fix. The hem is easy enough to shift back to the ground...I was just straightening it up to suit what I would use it for. You are probably right that for some it would be too much work though. If you look at the checked version you can see that I really need to play with it just a little more as there is still some distortion.